Investors experienced highly volatile equity markets in Q1 2018, with the Dow Jones Industrial Average (DJIA) plunging 1,600 points at its session lows on February 5, 2018. The DJIA closed down 1,175 points that day, its worst point decline in history. Market participants were and still are primarily fearing uncertainty stemming from the new Federal Reserve Chairman Jerome Powell, concern over rising interest rates, expectations for higher inflation, and rising wages for Fortune 500 companies which are heavily leveraged with debt. Global geopolitical risk also remains elevated with instability in the Middle East and North Korea. Under President Trump we have seen major reform to US foreign trade policies with new tariffs being set in place impacting global trade and impeding the recovery of the global economy. All of the above point investors to gold as they seek a short term hedge against volatility. It’s often heard that one’s portfolio should have a weighting of precious metal exposure with an allocation ranging between 5%-10% depending on the investors risk profile. Gaining exposure to gold can be done in a variety of ways such as purchasing physical bullion, a gold backed ETF, or the simplest form via gold equities. At the time of writing the YTD (Year-To-Date) performance of gold in 2018 is +1%. But a consensus view held by the top global gold producers hold a much more constructive view for 2018 and beyond. Much of the daily price fluctuations in gold are inversely correlated with the US dollar. The DXY (US Dollar Index) provides oversight of daily strength or weakness for the USD as it’s indexed against the top 5 global currencies. We can see from April 18, 2018 till now the DXY strengthening which inversely correlated with spot gold falling from approximately US$1,350 per ounce to just above US$1,310. The US economy is now in a period of rising interest rates which will further bolster the US dollar which adds near term pressure to the gold price, but further analysis is necessary to review the fundamentals. 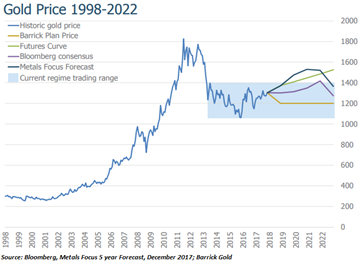 Since the end of the bear market in 2015, we have seen gold prices trend up making higher lows which appears to be reflective of the increased investment demand due to heightened systematic risk. Physical demand continues to come from central bank (Russia, China, and Turkey) purchases, physical gold-backed ETFs (SPDR), and jewelry demand. Jewelry demand is the largest factor in the demand equation as it accounts for approximately 50% of gold demand with the main buyers being China (Lunar New Year Festival) and India (Wedding season). In 2017 gold mine production globally was approximately 105M troy ounces. According to Goldcorp the fundamentals support strong gold pricing in the near term. The company highlighted that mine supply is expected to marginally decline by 1% annually through 2021. 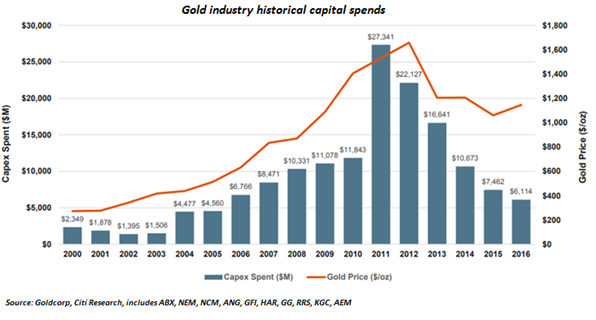 Furthermore, an analysis of the top 10 gold producers shows a reduction in developmental capital spending by >80% since 2012. Due to underinvestment in the form of exploration and capital expenditures, empty project pipelines, and a lack of new discoveries, these all factor into declining mine production and reduced supply in the coming years. These are all major catalysts for the gold price and why new gold discoveries are attracting premium valuations and investor’s attention right now. 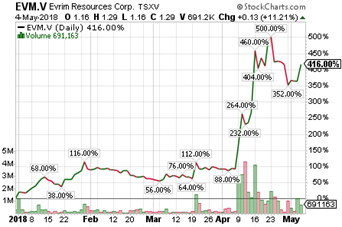 One of the newest gold discovery stocks is Evrim Resources (TSX-V: EVM) which released results from Trench #1 & #3 on April 9, 2018 with a headliner of 193.5 meters of 2.09 g/t gold at their 100% owned Cuale project. On those results early investors saw the stock rise approximately 250% since the start of the year. The investment community was closely watching as they knew follow up results from cross cut trench’s #2 & #4 were soon to be released which would add a “footprint” or provide dimensions to the mineralization at surface. Evrim was quick to release those results and published them on April 16, 2018 with a headline number of 106.2 meters grading 13.61 g/t gold at Cuale. This took EVM up to C$1.70 at its intra-day high for a 500% return YTD. The performance of EVM is synonymous with the scarcity the gold exploration sector is currently experiencing with the lack of new legitimate gold discoveries made in the last several years. Resource investors and exploration speculators are “hungry” for the next significant find and are willing to pay a premium to partake in such an opportunity. Aside from the fact that EVM’s management has skin in the game and that Cuale offers exploration upside, is that the deposit style is an epithermal gold-silver target which are known for being one of the lowest cost, largest scale, and long life mines when put into production. 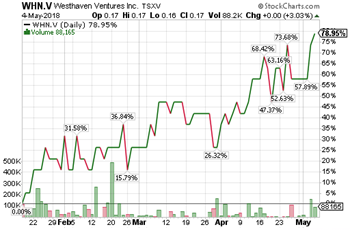 Another gold orientated discovery company, Westhaven Ventures (TSX-V: WHN) run by a group of serially successful explorationists, is currently drilling a potentially high grade epithermal gold target in an underexplored and emerging gold belt. At the end of 2017, Westhaven made a significant discovery at their Shovelnose gold project. After nearly a decade of drilling, they appear to have vectored in on a gold mineralized feeder structure. These are the structures that, given this type of deposit model, one can expect to find high grade gold mineralization at or near. Eager to get back and follow-up this newly discovered area, the South Zone, Westhaven initiated a 2,800m in late March. Drill results are starting to come back and it appears their targeting continues to improve. A news release disseminated yesterday highlighted 28.7 meters of 2.6 g/t gold, including 17.7 meters of 3.9 g/t gold and 2.9 meters of 9.7 g/t gold at a depth of 178 meters in hole SN18-03. With mineable widths of nearly 3 meters and approaching 10 g/t gold, this project becomes very interesting. Given that a majority of the drill results are still pending, there’s a lot to look forward to here in the very near term. Gren Thomas, president and chief executive officer of Westhaven, stated: "These initial results from the spring drilling campaign are very encouraging and demonstrate higher grade exists at depth, in addition to what's been found on surface. The South zone was only discovered at the end of 2017 and has had limited work to date. 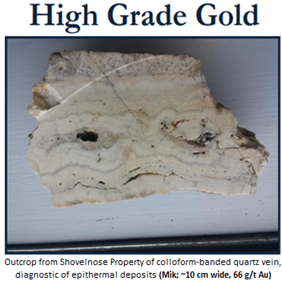 It is now the priority focus at Shovelnose, and we are confident that similar zones of gold mineralization will be found elsewhere within this newly discovered area." Mr. Thomas went on to add: "SN18-03 is the most encouraging hole drilled to date on Shovelnose, where Westhaven has carried out numerous small drill programs over a period of eight years and outlined a number of gold-rich zones. The company is looking forward to receiving the assays from the remaining four holes as all four holes intersected silicification and quartz veining at various depths over a strike length of 200 meters. A summer drill program will commence in June." As a resource speculator the best time to acquire a position in an explorer is when the company has their drills turning and news is imminent. Early investors in EVM were rewarded for being positioned before the announcement of the high grade gold at surface which provided investors a 4 to 5x return. As assays are pending and drilling at Shovelnose is currently vectoring in on the high grade gold feeder system, this is may be another opportunity to take an early position. The Shovelnose project is within the 100% owned project portfolio that includes 30,000 hectares within the prospective Spences Bridge Gold Belt, which is situated within a geological setting similar to those which host other significant epithermal systems. The SBGB is a 110-kilometre northwest-trending belt of intermediate to felsic volcanic rocks dominated by the Cretaceous Spences Bridge group. Westhaven’s technical advisor and Board member Ed Balon, P. Geo has 40+ years of geological experience and is known for his systematic approach to targeting favorable geological areas, and his detailed prospecting methods. 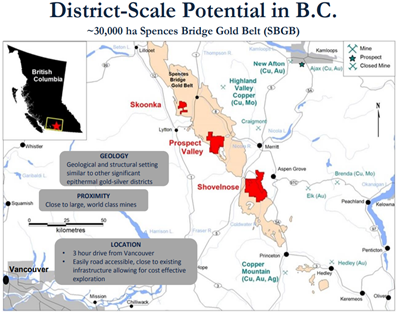 This approach led to the identification of the Spences Bridge epithermal gold belt in southern BC as well as other key discoveries in British Columbia, Northwest Territories, and the Yukon. The technical committee and Westhaven management believe these relatively underexplored volcanic rocks are highly prospective for epithermal style gold and silver mineralization. Westhaven’s current geological thesis is to discover a high-grade gold low sulphidation epithermal deposit. What Westhaven is targeting is a gold system similar to Yamana Gold’s El Penon low sulphidation epithermal high-grade underground gold and silver mine located in Chile which produced 161koz Au and 4.28Moz Ag in 2017 and has reserves (P&P) of 764k oz Au & 26.58M oz Ag with resources (M&I) of 318k oz Au & 10M oz Ag. Low sulphidation epithermal deposits make some of the lowest cost highest margin gold mines around the globe. Kinross’s Kupol mine situated in the Russian Far East is another great example of the potential of these types of deposits. It’s a high grade underground gold mine which had cash costs of US $521/oz reported in 2017 with gold equivalent production of 580,451 oz. Kupol & sister deposit Dvoinoye had reported reserves (P&P) in 2017 of 2.011M oz Au & 17.08M oz Ag with resources (M&I) of 323k oz Au & 3.91M oz Ag. Another analogy to what Westhaven is targeting is the giant epithermal system which formed Newmont’s Cripple Creek gold and silver mine in Colorado. This mine has produced 23Moz Au and has a current production profile of 451,000oz Au per year. Cripple Creek has been in production since 1976, employs 700 staff, and is the largest gold mine in the state of Colorado. As you can tell, Westhaven is hunting for “elephant” sized gold deposits here. Their goal of this season’s exploration program is to uncover a low sulphidation epithermal gold deposit which has the future potential to contain millions of high grade ounces such as the similar style deposits above. The regional geology in the Spences Bridge Gold Belt (SBGB) hosts the Southern Intermontane tectonic belt which has low sulphidation epithermal gold quartz veins occurring throughout the range. Along the belt Westhaven also has the Skoonka Creek property and Prospect Valley. 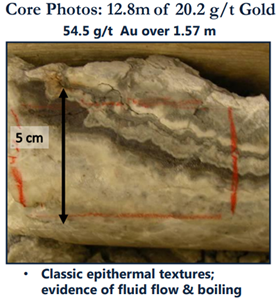 In 2005, with the 1st drill program ever on the belt, an intercept grading 20.2 g/t gold over 12.8 meters confirmed the presence of high grade epithermal gold on the SBGB at the Skoonka Creek property. As mentioned, Westhaven is currently completing the 2,800 meter spring drill program at the Shovelnose gold project which is following up on the South Zone discovery (17.7 meters of 3.9 g/t gold) with additional results expected to be released in mid to late May. Drilling at the Skoonka property will take place in the early summer months. As a resource investor, if you are looking for exploration upside in a safe jurisdiction, with a company who has 100% ownership of a large land package in an underexplored gold belt, and is currently drilling a newly made discovery with results to be released soon, put Westhaven Ventures (TSX-V: WHN) on your watch list. Disclaimer: All statements in this report, other than statements of historical fact should be considered forward-looking statements. These statements relate to future events or future performance. Forward-looking statements are often, but not always identified by the use of words such as "seek", "anticipate", "plan", "continue", "estimate", "expect", "may", "will", "project", "predict", "potential", "targeting", "intend", "could", "might", "should", "believe" and similar expressions. Much of this report is comprised of statements of projection. These statements involve known and unknown risks, uncertainties and other factors that may cause actual results or events to differ materially from those anticipated in such forward-looking statements. Risks and uncertainties respecting mineral exploration companies are generally disclosed in the annual financial or other filing documents of those and similar companies as filed with the relevant securities commissions, and should be reviewed by any reader of this newsletter. Nothing in this article should be construed as a solicitation to buy or sell any securities mentioned anywhere in this newsletter. This article is intended for informational and entertainment purposes only.Before investing in any securities, you should consult with your financial advisor and a registered broker-dealer. The Author shall not be liable for any damages, losses, or costs of any kind or type arising out of or in any way connected with the use of this article. You should independently investigate and fully understand all risks before investing. When investing in speculative stocks, it is possible to lose your entire investment. Any decision to purchase or sell as a result of the opinions expressed in this report will be the full responsibility of the person authorizing such transaction, and should only be made after such person has consulted a registered financial advisor and conducted thorough due diligence. Information in this report has been obtained from sources considered to be reliable, but we do not guarantee that they are accurate or complete.